Traveling in an RV is the epitome of Ralph Waldo Emerson’s “Life is a journey, not a destination.” For those who cannot but heed the call of the road, RVs and motorhomes are a great way to spend the time, whether it’s just over the weekend, a couple of weeks, a month, or the whole summer, and, yet, despite being practically on the move the whole time, people still lust for a relaxed bike ride, to enjoy the scenery in a way no motor vehicle can ever hope to match (yes, this includes motorcycles). And this is exactly where RV and motorhome mounted bike racks come into play. Choosing the right rack can be nerve-wracking (if you’ll pardon the pun), so we prepared a list of top five RV and motorhome bike racks for you. We begin the first leg of this journey with the ever-trusty Swagman and their RV Ladder Rack. 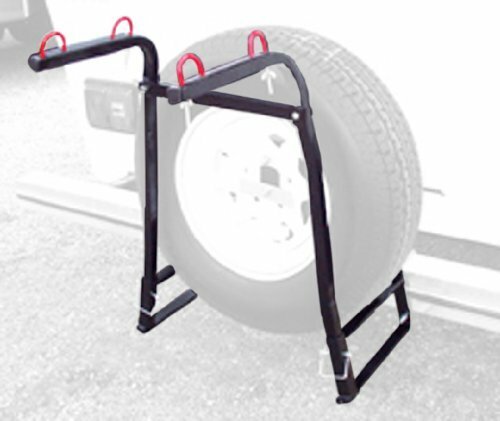 This is pretty much what it reads on the tin – a bike rack that mounts on your RV’s or motorhome’s ladder. Needless to say, if you have one of those models that feature a ladder on the side, this is not exactly the thing for you. The rack can carry up to two bikes, provided they weigh no more than 35 pounds each. In other words, the maximum load on the rack is 70 pounds. It’s made out of aluminum, so you know it’s lightweight and resistant to corrosion. It installs ridiculously easily thanks to the simple, yet ingenious hook design. Be sure to hook it on the top rung, so that the bikes have plenty of room to hang without touching the ground. Secure them using the straps that come with the rack, and enjoy the journey. Of course, you can use a bike lock on top of that just to be sure, as well as to prevent the bike from “falling off” from the back. 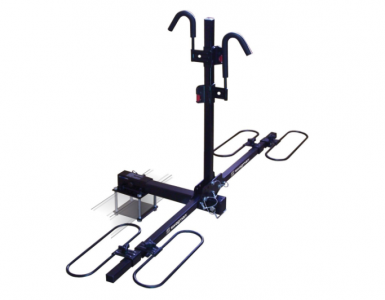 For your peace of mind, the rack comes with the usual Swagman limited lifetime warranty. 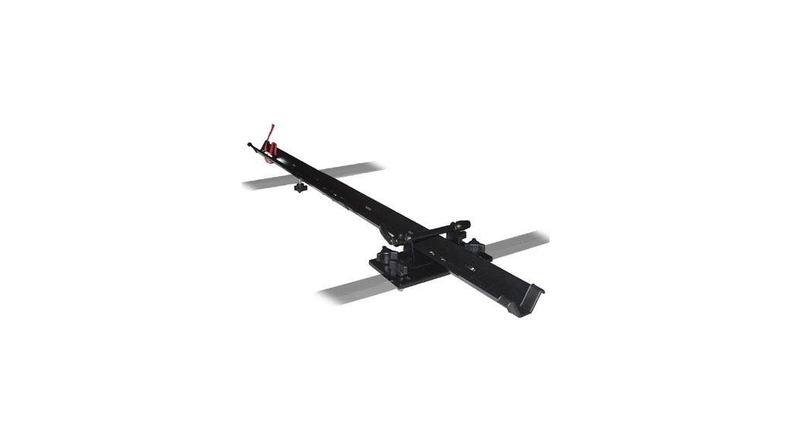 As you might’ve guessed already, the rack mounts on 4–4.5-inch continuously welded bumpers (using the bumper adaptor) or any 2-inch class 3 hitch receiver (without the bumper adaptor). This gives you a nice versatility in mounting choices, which, although it may not seem as much, does count when you’re looking to use every available inch of space, as is the case with RV trips. You can mount up to two bikes on the Traveler, as long as they weigh no more than 35 pounds each. They mount horizontally, of course, and without having to detach the front wheel.For this purpose, the rack features sliding wheel hoops that can accommodate any wheel between 20 and 29 inches, as well as push button ratchet arms which adjust so that they clamp onto the bike, securing it in place. Don’t worry, the arms have padded hooks, so they don’t mar the finish on your bike’s frame. 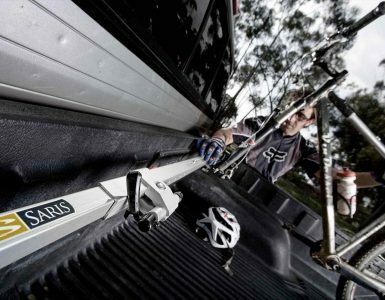 The Swagman 2-Bike RV Bumper Rack does what the name promises, and much more.It’s obviously a bumper mounted model, able to fit any square bumper with 4 to 4.5 inches to a side. It installs around the bumper using a 6.5 and 8-inch long bolts. If you’re worried the rack won’t survive the stress, don’t be. The frame is made out of heavy duty steel, painted in black and powder-coated so that it can resist corrosion. The bolts used to secure it in place are heavy duty steel, as well. As the astute readers may have already guessed, the rack packs up to two bikes, provided they weigh no more than 30 pounds each.It should fit most any type of bike, from road to mountain and hybrid, as well as all frame and wheel sizes.There’s even an upright bar in the center of the rack which is designed to give your bikes additional support and keep them stable while towing. Of course, you can always use a cable lock, just to be sure the bikes won’t wobble, as well as to dissuade the five-finger-discount folks. Although, to be honest, when you compare the price the rack is going for at the moment and the quality you’re getting, buying it is practically a steal, so we shouldn’t be pointing fingers just yet. 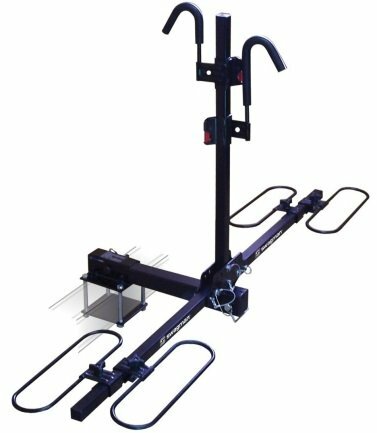 All jokes aside, though, the rack is incredibly useful, and comes with a short price-tag, at that.You can mount up to two bikes on it, with no limitations on the load (well, within reason, don’t go hooking your Harley just yet). Still, it should handle a pair of road bikes without hassle. Just mount the bikes, fitting them in the nice, cushioned rubber cradles, and secure them using the flexible rubber straps. Make sure you hook the rack on the top rung so that the bikes have enough space to hang without touching the ground. 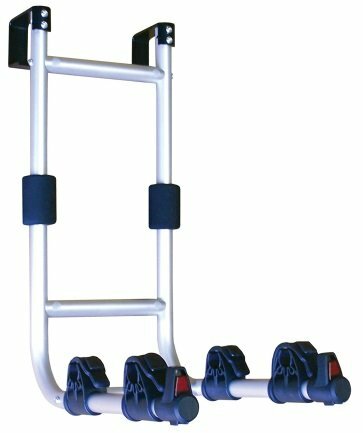 The Swagman Mighty Rack is the ideal choice for folks who want to keep the ladder on their RV, motorhome or van accessible at any time but have a spare tire blocking the bumper. 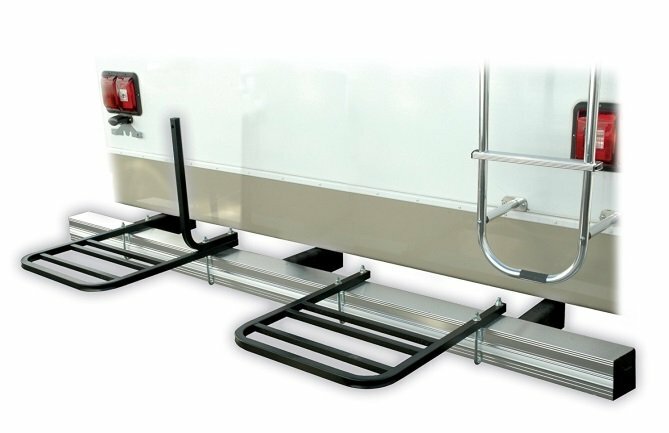 The reason is simple – the Mighty Rack (got to love the naming pattern at Swagman’s) mounts around your spare and onto the bumper, which makes it perfect for RVs with no hitch.Of course, you can use the rack without the spare tire, just mount it straight to the bumper. You can install it fairly easily by simply positioning the rack around the spare tire and feeding the U-bolts supplied around the bumper, then secure it with a lock washer and a nut.And if you do need the access to the tire, you can simply remove the pins that lock the upright bars of the rack and lift those off.It does require some assembly before actually hooking it up, but if you’re ever played with LEGOs or assembled stuff from IKEA, you’re more than qualified to do it. Luckily, everything is supplied, from bolts, nuts, and washers to U-bolts andJ-hooks. 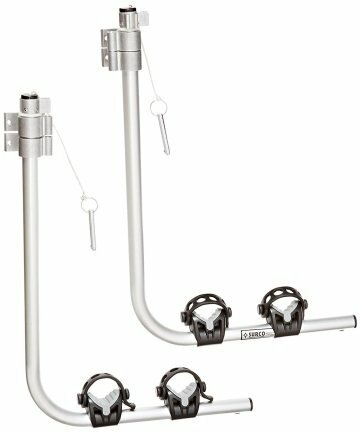 The rack can carry two bikes with the maximum weight capacity of 70 pounds, or 35 pounds each.To secure them, just use the J-hooks supplied, tightening down the handles. Once you’ve done this, take the straps that come with the purchase and cinch them around the frame to eliminate wobble entirely.